Star Wars Liquid Reactive Umbrella | Nerd Much? Get a spring in your step with this lovely Star Wars Liquid Reactive Umbrella for only $19.00 USD. When dry, this umbrella’s art is entirely in black, white, and blue. The characters are drawn in a cute cartoon style and include a stormtrooper, C3PO, R2D2, Han Solo, Darth Vader, Princess Leia, and Chewbacca. There is one character per panel between the ribs of the umbrella. Around them are blue and white stars set in a gentle spiral inwards. When wet, all the characters are in their appropriate colors; even the stormtrooper turns gray and gets blue shadows on his helmet. Some of the white stars turn a bright pink while the others remain white and blue. This is a travel umbrella with a short handle, the perfect size to fit in any bag, purse, suitcase, or carryon. The sheath for the umbrella is almost entirely black, like the umbrella itself, save for small blue stars and the Star Wars logo on one side. There is even a small wrist strap for easier carrying and storage. The Star Wars Liquid Reactive Umbrella is currently 20% off at Hot Topic. The original price is $19.00 USD and the sale price is $15.92 USD. 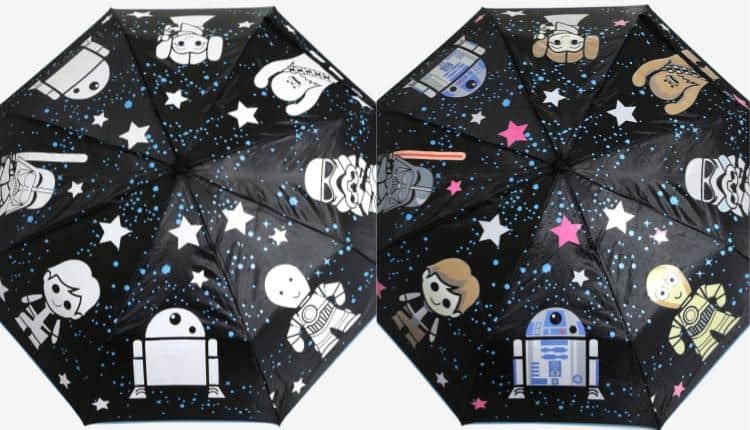 This sale is for online purchases only, so be sure to click the link below and get your awesome Star Wars umbrella now! The next Star Wars movie, Episode IX, will not be out until December 20, 2019 – but you can still show off your Star Wars pride with this awesome umbrella. If nothing else, it changes colors in the rain; what could possibly better? And, should it happen to be a rainy day, you can bring your umbrella to the Star Wars: Episode IX premiere. The film will be written and directed by J.J. Abrams. Thus far, the film will star Daisy Ridley as Rey, Adam Driver as Kylo Red, Oscar Isaac as Poe Dameron, and John Boyega as Finn. It is rumored that Lupita Nyong’o will return to play the part of Maz Kanata, the alien merchant in Force Awakens that was holding onto the lightsaber for Rey.